Zecco Wall Street Facebook App lets you trade stocks directly from your Facebook page. The app is free, but you do need to have a Zecco brokerage account in order to trade stocks and ETFs using the app. Zecco charges $4.95 commission for each online trade, regardless the number of shares. 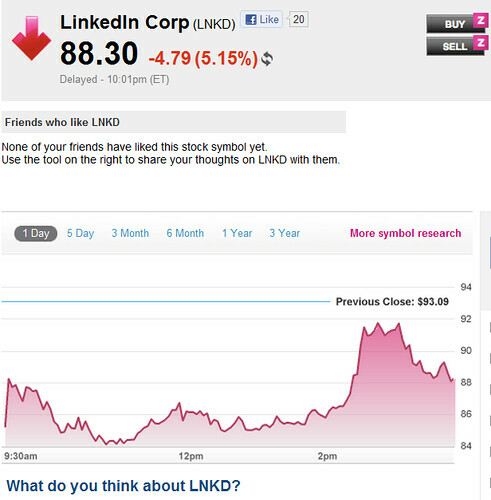 In the past couple of years, social networks like Facebook, LinkedIn (LNKD, which went public as the first social media last week) and Twitter have become very popular. They are not only tools for social connections, but also a channel for business. As a result, more and more companies are now increasingly turning to social media to reach out to existing and potential customers. 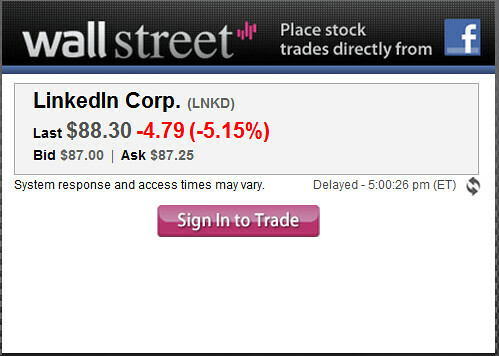 Nowadays, you can do many things with social networks, even trading stocks. Online discount broker Zecco has recently launched its own Facebook app, Wall Street, which lets users get real-time stock quotes, charts, and even buy and sell stocks if you want to, all from their Facebook accounts directly. 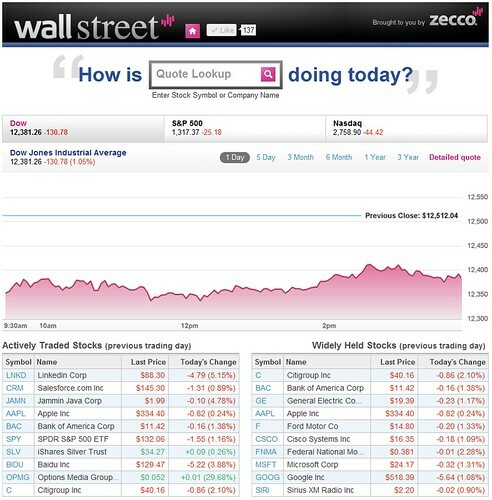 Above is a screenshot of the Wall Street app from Zecco. As you can see, with this app, you can have real-time display of the three major indexes and quotes of actively traded stocks during the trading session (you can’t customize which stocks you want to display though). There’s nothing about having real-time quotes, because right now you can get them from many places, such as Google and Yahoo Finance for free. What I think is new with this app is that you can actually trade stocks with it. To trade a stock, you will need to enter the symbol of the stock and get a real-time quote first (remember, even though the quotes are delivered in real time, they are not streaming quotes, meaning you will need to manually refresh the screen to get an update) and bring up a new page, which will show the Buy and Sell button alongside the stock quote. Of course, since this app is developed by Zecco, the broker, you will need a Zecco account in order to place a trade. To clarify, when I said you can trade stocks directly from Facebook, it’s not that you log into your Facebook account and start to trade from there. No. As you can see from the screenshot below, you have to log into your Zecco account before you can make a trade. When Zecco eliminated commission-free trades all together and increased stock trading commission in March, I didn’t like the changes they made. I mean, after being their customers for four years, I have seen they changed their pricing schedule many times, and each time trading with Zecco got more expensive. That’s why I don’t use Zecco that much these days as I used to. That said, it does appear that Zecco is quite innovative in bringing out new tools to make trading stocks easier for their customers. Around this time last year, they introduced Zap Trade, a Firefox add-on that allows users to trade stocks anywhere on the web. It’s a tool that I didn’t see any other broker has. Now with this Wall Street Facebook app, I think they are once again one step ahead of their competitors in connecting stock trading with social media. From what I know, what most other brokers have is just a Facebook fan page, which you can’t really do much with it. We can assure you that the trading functionality (Zap Trade) is fully secure. There actually is no integration or even exchange of information between your Facebook profile and Zecco Trading account. If you are not familiar with Zecco Trading, you can see my previous discussion on Zecco for more details. Basically, it’s an online discount broker that lets you buy stocks and ETFs for $4.95 per order, regardless the number of shares. In addition to stock trading, you can also trade Forex with Zecco (you can get a practice account for free). Zap Trade, as mentioned above, is one of the tools that Zecco developed to let its customers trade stocks without going to Zecco’s website. Access The Wall Street Journal for Free?